For An Author, nothing is more fun than getting together with a Fan Friend or a Book Club. I’ve been fortunate enough to do both and recently I had an opportunity to meet a Kansas Gal who is friend, fan and beta reader. Great fun. I met Elizabeth Richards on Goodreads when I wrote to thank her for a review she’d done of Spare Change, she then went on to suggest Spare Change as her local Book Club read and I visited with the group when they met to discuss the book…by telephone, of course. Over the course of time and books, Elizabeth and I became friends, then she told me that she and hubby had already planned a Florida vacation for May…unfortunately they were headed to Naples (Florida’s West Coast) and we are in Port St. Lucie on the East Coast. 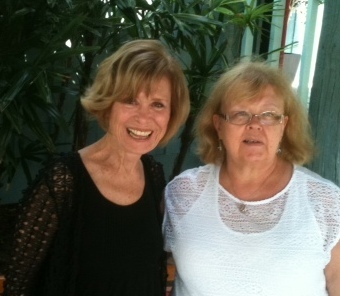 But like the heros and heroines of our books, those obstacles did not stand in our way, we met in Fort Lauderdale by the Sea and enjoyed a three-hour lunch. Yum, lobster rolls, crab melts and iced tea. It is so much fun to learn about the lives of our readers. How she and hubby met, all the fun places they’ve lived, their family, and of course we talked about our dogs – doesn’t everyone? So, I say to all of you, just as I said to Elizabeth…If you’re in the neighborhood, look me up. And remember, I have a veyr large neighborhood. Thanks Elizabeth for a wonderful afternoon. Mike and I had a wonderful time with you and your husband! My door’s always open to you when you travel to Kansas. You know, we’re not just cowboys and indians anymore! Great post. Thank you, Bette.